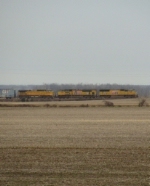 Title: UP SD70ACe ON A NORTHBOUND INTERMODAL!!! Description: These are my favorite locomotives!!! This was my second UP ACe!!! Description: Best paint job in the history of railroads. Description: Complete with a rolling barbecue C40-8. Description: Part of five unit westbound covered hopper train waiting on siding. Description: The Consist Led by UP 8403 in reverse showing the units on a slight curve WB. Description: In between cutting up trees from the ice storm and rolling a fallen carport back over UP Train MNLTT 13 scooted by our house. Description: Great horn on this girl. She was the lead for UP's MFWLI-24. UP 7667 was the DPU. Description: Three UP train running at the same time in Cajon Pass. In the upper level, two merchandise trains meeting at the former SP tracks. Note the DPU units in the westbound train. In the foreground, an eastbound coal train going up hill.